PennsylvAsia: Chinese documentary Four Springs (四个春天) and Q&A with filmmaker, April 6 at Carnegie Mellon University. Chinese documentary Four Springs (四个春天) and Q&A with filmmaker, April 6 at Carnegie Mellon University. 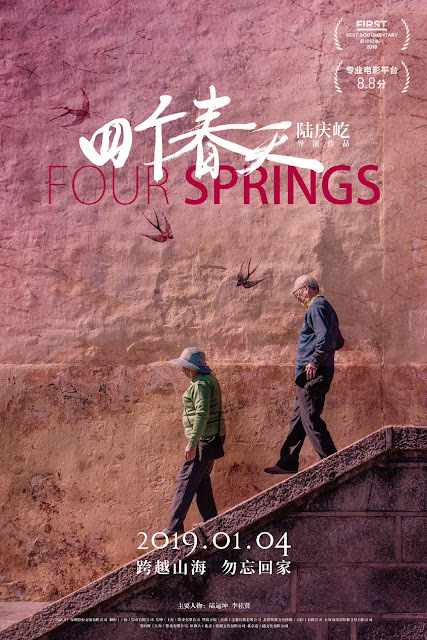 The 2017 Chinese documentary Four Springs (四个春天) will play at Carnegie Mellon University on April 6, part of the CMU International Film Festival. After the popularity of his online diary, “My Father,” filmmaker Lu Qingyi decided to turn a camera on his parents’ everyday life in the remote town in Guizhou. Over four springs, we see the flow of life: chores, singing, hikes, celebrations, funerals, reunions, and separation. After a family tragedy forces Qingyi from the role of participant to observer, he becomes more deeply moved by the open-minded, pristine life philosophy his parents reveal through their everyday interactions with people and nature. Through the tool of cinema, Lu crafts a profound visual diary of family in southwest China that will have the viewer calling their family to say “I love you” as soon as the screen goes dark. The movie plays at 7:30 pm in the McConomy Auditorium and is accompanied by a Q&A session with the filmmaker. Tickets are available online.